Auch ich war begeistert von dieser Münze, die ich vor einigen Monaten aus einer Wühlkiste "rettete". Obv. : ESTADOS UNIDOS MEXICANOS , Mexico's national symbol, an Eagle with Snake in beak, perched on cactus, enclosed in a circle formed by the legend and a wreath. Rev. 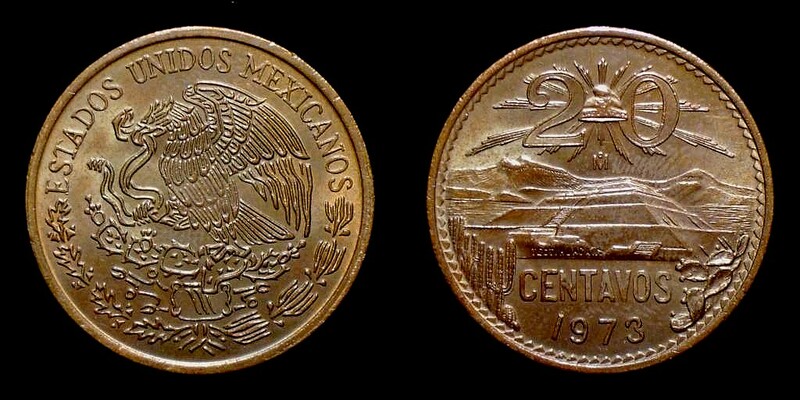 : 20 / M° // CENTAVOS 1973 , Mexico's Liberty Cap with inscription "LIBERTAD" in the center of rays, beneath mint mark of Mexico City, in center the Mayan Pyramid Temple at Teotihuacan and surrounding landscape, the "Piramide del Sol", inscription "TEOTIHUACAN" at the basis; cacti on both sides at the bottom. Schöne Fotos, Arminius. Vielen Dank für die guten Blick auf dieses Stück. Beautiful photos, Arminius. Thanks for the good look at this piece. Vor zwei, drei Jahren war ich in Mexiko. Mein Schlüsselanhänger war gerade kaputt gegangen und da fand ich nahe des Zocalo einem Straßenstand, der in Plexiglas oder Kunstharz gegossene mexikanische Münzen als Anhänger verkaufte. Ich entschied mich für die Pyramide, Jahrgang 1970. Leider ist mir mein Schlüsselbund inzwischen schon mehrmals heruntergefallen, so dass die Ummantelung etwas angeschlagen ist. Ich hoffe aber, dass es der Anhänger noch einige Jahre tut. Two oder three years ago I was in Mexico Ciudad. My old key fob was broken. In the near of the Zocalo I found a street hawker, who sells Mexican coins in plexiglass or synthetik resin as key fobs. I decided to buy the pyramide coin, year 1970. Unfortunatly my bunch of keys is fallen more then once. So the Plexiglass is broken a little bit. But I hope to use the key fob some years more. Ich hoffe aber, dass es der Anhänger noch einige Jahre tut. Da bin ich neugierig, kann man von dem Anhänger ein Bild sehen? Vielen Dank für den Beitrag—Spaß zu sehen und zu hören, was wurde von einem anderen Mexikos "Pyramiden." A Mexican 20-centavo piece, of the 1955-1971 type! Its “Pyramid of the Sun,” if it still remains on the piece, is hidden under the Kennedy’s reverse.